As a young man in Germany during the Thirties, Gerhard M. was an amateur photographer who preserved his work in a photo album. In 1941, when he was sent to the Eastern Front as a German soldier, he took along a camera to record his combat experiences in the Soviet Union. Based on his wartime diary and photo album, AMATEUR PHOTOGRAPHER recounts Gerhard M.'s experiences with his unit, which was engaged in "retaliatory measures in captured areas." Eager to document his wartime exploits, Gerhard took numerous photos, including both quickly-recorded snapshots and carefully composed portraits His subjects included fellow soldiers, Soviet prisoners and other civilian victims of the war, the Germany army's expropriation of livestock and other food supplies from the local populace, and a temporary leave spent happily in Berlin with his fiancée. 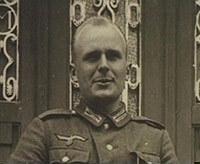 After the war, as a citizen of the German Democratic Republic and a dues-paying member of the Soviet-German Friendship Society, Gerhard M. came to regret his enthusiasm for photography. 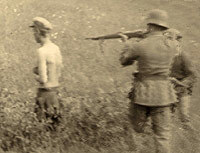 The discovery by East German Communist authorities of his incriminating diary and photo album, replete with horrific images of executions and other atrocities, no longer regarded as personal souvenirs but as legal evidence, led to Gerhard M.'s conviction by a Soviet court and his execution by firing squad in 1952.